Last segment we saw how Jesus fulfills the roles of both Adam and Israel. Whereas the disobedience of the prior two had invalidated their roles as God’s representatives on the earth, because of Jesus’ obedience, as we’ll see in this segment, He reinstates God’s mission by commissioning the church to go out on mission and represent God’s kingship to the ends of the earth. Because Jesus was obedient, He has been given all authority in heaven and on earth. Because Jesus has all authority, He commissions His followers to go and disciple the nations concerning His saving work. This grounds the church’s mission in Jesus’ obedience, which means that the church’s success in mission is based on the faithfulness of Jesus rather than our own. “Thus it is written, that the Christ should suffer and on the third day rise from the dead, and that repentance and forgiveness of sins should be proclaimed in his name to all nations, beginning from Jerusalem” (Luke 24:46-47). Whereas Matthew’s version focuses on baptizing and teaching people to obey, Luke’s version emphasizes preaching repentance and forgiveness. These are essentially the same ideas, as baptism represents the washing away of sin in forgiveness (cf. Acts 2:38) and part and parcel of obeying Jesus’ commands is recognizing that we don’t always obey and thus need to repent. The other passages we’ve looked at specify that Jesus’ followers should go to “all nations.” Here He specifies that they need to do so by expanding geographically. When we studied the tower of Babel, we noted that the nations were created because of humanity’s failure to represent God geographically. God dispersed the nations over the face of the whole earth because they did not “fill the earth” as God had commanded. This means that taking the gospel to “all nations” is not an end in itself, but is the means toward fulfilling that mission that the Babel generation rebelled against. 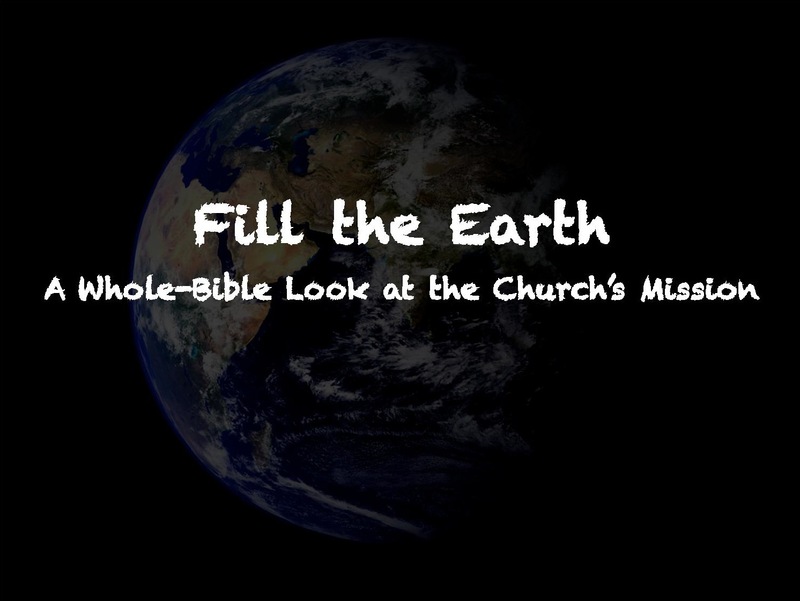 Because the nations have been spread across the fullness of the earth, going to them with the gospel is the way we “fill the earth” as God’s people. Confirming this is our next major point. In the book of Acts, the language of the creation mission is applied to the spread of the word of God and the multiplication of disciples. In Acts 6, after the seven so-called deacons are called, verse 7 says, “So the word of God was fruitful. The number of disciples in Jerusalem multiplied rapidly.” This is the way that God’s representation through His images spreads now – when they turn to Him as King in repentance and faith as the word of God is preached to them. In Acts 12, Herod is trying to stifle the church’s growth through persecution. However, after he fails to give God glory when a crowd declares that he is a god, an angel of the Lord strikes him dead. After this, we read in verse 24, “But the word of God was fruitful and multiplied.” What is being contrasted here is Herod’s attempts to stifle God’s people and exalt himself as king and god, and the unstoppable spread of the word of God, which is the message that He is King. In Acts 19, seven sons of Sceva, who were Jewish exorcists, “undertook to invoke the name of the Lord Jesus over those who had evil spirits, saying, ‘I adjure you by the Jesus whom Paul proclaims'” (v. 13). After one of these evil spirits attacks them, v. 17 says, “And this became known to all the residents of Ephesus, both Jews and Greeks. And fear fell upon them all, and the name of the Lord Jesus was extolled,” that is, Jesus’ name was held is high honor. This leads many to repent from their sinful magical arts (v. 18-19). Then we read in v. 20: “So the word of the Lord continued to be fruitful and prevail mightily.” In short, as people repent of their sin and turn toward Jesus in faith, God’s creation mission advances. Since God’s creation mission involved humanity “being fruitful and multiplying and filling the earth,” it follows that the preaching of the good news must spread geographically. And this is exactly what we see when we examine the structure of the book of Acts. Acts is structured according to the threefold movement present in Jesus’ commission in 1:8. This description represents concentric circles expanding outward. In Acts 1-7, the geographic focus is Jerusalem. In Acts 1:4, Jesus tells the disciples, “Do not leave Jerusalem, but wait for the gift my Father promised, which you have heard me speak about.” The stories that follow are all set in Jerusalem. Then in Acts 10, Peters converts Cornelius the centurion in Caesarea, which is in the region of Samaria. 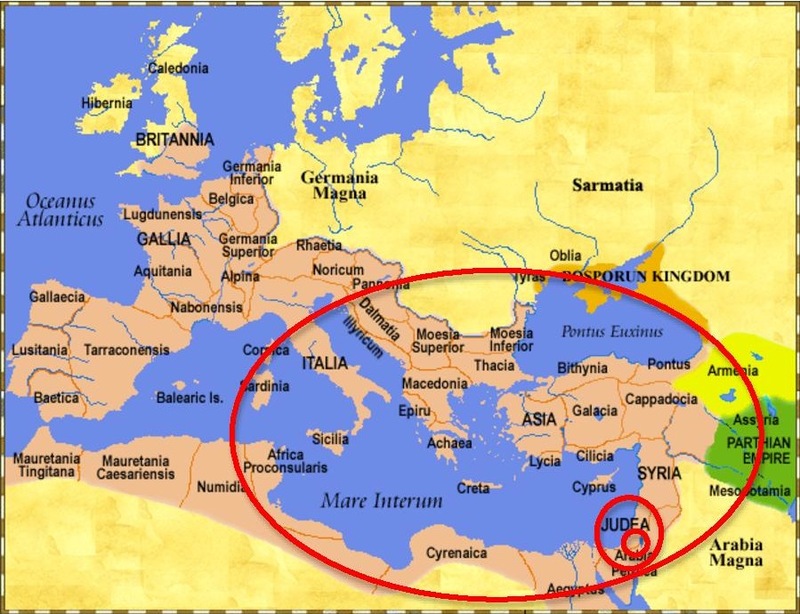 In Acts 13-28, the geographic focus expands again to the ends of the earth as Paul and Barnabas begin the Gentile mission. The book of Acts ends with Paul in Rome, the center of the Gentile world at that time, “proclaiming the kingdom of God” (28:31). One aspect of Acts 1:8 that we haven’t yet emphasized is the first part: “But you will receive power when the Holy Spirit comes on you.” As the church expands geographically, preaching repentance and forgiveness, baptizing, and teaching Jesus’ commands, they will go forth in the power of the Spirit. “You are witnesses of these things. I am going to send you what my Father has promised; but stay in the city until you have been clothed with power from on high” (Luke 24:48-49). In the Old Testament, the Holy Spirit had not been poured out in such a way to empower the people’s mission. But after Jesus ascends and takes His seat of authority, He extends His kingdom through His people, by His Spirit. This is confirmed by what v. 5 says: “Now there were dwelling in Jerusalem Jews, devout men from every nation under heaven.” With the outpouring of the Spirit, the apostles spoke of “the mighty works of God” in the various languages of the nations. This was a sort of foreshadowing of what their mission would entail. Through the witness of the church, people from all the nations would come to give glory to God. Occurrences of tongue-speaking in Acts confirm this threefold, international, geographical expansion. Tongue-speaking occurs only three times in Acts, and these three occurrences follow the concentrically expanding geographical movement of the gospel. Occurrence 1: Acts 2. This first occurrence is at the original outpouring of the Spirit at Pentecost, which happened in Jerusalem. This is the first major Gentile conversion in the book, evidenced by the apostles response in 11:1. The point of these various tongue-speaking events is to show that the mission in Acts is happening by the power of the Holy Spirit. Therefore, in summary, we may say that as the word of God is fruitful and multiplies, God’s people engage in a redemptive spread of the image of God by filling the earth with the gospel. (1) God called Adam to fulfill this mission, but Adam fell because of disobedience and was exiled out of God’s presence in the Garden. (2) God called Abram/Israel to fulfill this mission, but Israel also fell because of disobedience and therefore, like Adam, was exiled out of God’s presence in the Promised Land. This brings us to the New Testament and the person and work of Jesus. What we’re going to see is that Jesus fulfills the roles of both Adam and Israel and was faithful where they were unfaithful. And as we’ll see next week, because of Jesus’ faithful obedience, He commissions and empowers His church to carry out God’s mission. First, the Gospels all begin by drawing connections between Jesus and Genesis/Adam. Matt 1:1: “The book of the genealogy of Jesus Christ, the son of David, the son of Abraham.” The underlined phrase here only occurs 2x in the Greek OT, both times in the early chapters of Genesis (2:4; 5:1). Gen 5:1 is literally a mirror image of this verse: “This is the book of the genealogy of Adam.” So as soon as we open the pages of the NT, we are reminded of passages that discuss Adam and creation. Mark 1:1: “The beginning of the gospel of Jesus Christ, the Son of God.” The word “beginning” here reminds us of how the book of Genesis begins: “In the beginning, God created the heavens and the earth” (Gen 1:1). Again, this is the same term used in the Greek OT at creation. All of this sets us up to read the Gospels as narratives of a divine restart. Each one goes back to the beginning to introduce Jesus as a second Adam figure. However, whereas the first Adam disobeyed, the Gospels tell the story of Jesus’ perfect obedience. The first 3 Gospels all include the famous statement by God the Father, “This is my Son, whom I love; with him I am well pleased” (Matt 3:17; Mark 1:11; Luke 3:22). As we will see, the Father is well pleased because of Jesus’ faithful obedience. And John similarly emphasizes Jesus’ obedience at various points. For example, in John 17:4, Jesus says to the Father, “I have brought you glory on earth by completing the work you gave me to do.” While the first Adam did not complete the work that God gave him to do, Jesus did. The Epistles continue this parallel/contrast between Adam and Jesus. According to Paul, in Adam all people receive sin and death: “Sin came into the world through one man, and death through sin, and so death spread to all men” (Rom 5:12). Because Adam represented all his offspring, when he fell into sin, so did we. Paul goes on to say that Jesus fulfills the same representative role that Adam had, referring to Adam as “a type of the one who was to come,” i.e., Jesus (v. 14). However, through Jesus, instead of receiving sin and death, we receive righteousness: “For as by the one man’s disobedience the many were made sinners, so by the one man’s obedience the many will be made righteous” (v. 19). Elsewhere Paul summarizes the same idea: “For since death came through a man, the resurrection of the dead comes also through a man. For as in Adam all die, so in Christ all will be made alive” (1 Cor 15:21-22). This is why Paul can call Jesus “the last Adam” (1 Cor 15:45). Just as Jesus fulfills the same role as Adam, so does He fulfill the same role as Israel. In Matthew, Jesus fulfills the role of faithful Israel. First, Matthew’s genealogy introduces Jesus as the son of Abraham. “The book of the genealogy of Jesus Christ, the son of David, the son of Abraham” (Matt 1:1). This introduction paves the way for Jesus to be portrayed as the faithful son of Abraham, a role that Israel was supposed to have. “And Joseph rose and took the child and his mother by night and departed to Egypt and remained there until the death of Herod. This was to fulfill what the Lord had spoken by the prophet, ‘Out of Egypt I called my son‘” (Matt 2:14-15). “When Israel was a child, I loved him, and out of Egypt I called my son. The more they were called, the more they went away; they kept sacrificing to the Baals and burning offerings to idols” (Hos 11:1-2). In the original context, Hosea is reflecting back on Israel’s exodus from Egypt some 700 years prior. The reason that Matthew says that Jesus is fulfilling this prophecy is because Jesus is reliving the history of Israel, as the following narratives confirm. “For I do not want you to be unaware, brothers, that our fathers were all under the cloud, and all passed through the sea, and all were baptized into Moses in the cloud and in the sea” (1 Cor 10:1-2). Jesus after His baptism: “This is my beloved Son, with whom I am well pleased” (Matt 3:17). “Then Jesus was led up by the Spirit into the wilderness to be tempted by the devil. And after fasting forty days and forty nights, he was hungry” (Matt 4:1-2). These 40 days correspond to the 40 years that Israel wandered in the desert. Throughout this period, the devil comes to tempt Jesus, and if we look at these temptations, we see that they correspond to particular failures of Israel during their time in the wilderness. Each of Jesus’ responses includes a quotation from the book of Deuteronomy, which was written at the end of the 40 years in the desert. Significantly, the portions of Deuteronomy that Jesus quotes are the very points where Moses is recalling these particular failures of Israel, which correspond to Satan’s temptations of Jesus. In so doing, Jesus shows himself faithful to the word of God where Israel was unfaithful. Num 21:4-5: “They traveled from Mount Hor along the route to the Red Sea, to go around Edom. But the people grew impatient on the way; they spoke against God and against Moses, and said, “Why have you brought us up out of Egypt to die in the desert? There is no bread! There is no water! And we detest this miserable food!” (i.e., manna). All this shows that Matthew is depicting Jesus as reliving the formative period of Israel’s history, yet Jesus is faithful where Israel was unfaithful. For Paul, those who put their faith in Jesus become true Israelites. Paul states this succinctly in Gal 3:29: “If you belong to Christ, then you are Abraham’s seed, and heirs according to the promise.” This means that the church–those who belong to Christ–are set up to accomplish the mission of Abraham. As we’ve seen, God promised Abraham that through his offspring all the nations of the earth would be blessed (e.g., Gen 18:18; 22:18; 26:4), and that this promise was a reassertion of the creation mission (see here). Therefore, those who are in Christ are heirs of the promise that God will enable them to represent His kingship all over the world. Jesus has redeemed God’s mission.